The world of Duel Masters is one of five great civilizations. Through a card game, duelists can bring these worlds into existence, making what was previously abstract into reality. These skilled duelists are known as Kaijudo masters. Shobu Kirifuda is the best player at his local playground, and seeks to become a world-class master like his father. His first step on the road to conquest begins with winning a local tournament. Rather, it should have, except he is destroyed by the best Kaijudo master in the world, Knight. Shobu loses, but upon remembering the words of wisdom his father instilled into him, decides to continue on the road of becoming a duelist who can enjoy the game for what it is. And so begins his journey to victory－and as we all know, the journey is the most important part! +If you’re aged 12 or below, then you might actually like this anime. +If you prefer Cartoon Network and Disney type cartoons over actual anime, then this is a real treat. The 3D creature animations are cool. +The actual Duel Masters Trading Card Game isn’t half bad. I bought a few packs and played it with my friends around 7 years back. It’s pretty entertaining if you understand the concept. +Dubbing is, to an extent, well done in English. No idea about the JAP version. +The comedy is at a passable level and you find yourself laughing with AND at the show. +And of course, if you’re already a fan of the Duel Masters TDC, then you can’t go wrong with this anime. -If you like Yu-Gi-Oh, then you’re going to absolutely LOATHE this anime, because Duel Masters is, at the end of the day, a Yu-Gi-Oh rip off. -The animation is dreadful. Normal movements are terribly done and the character design is a disaster. Who’s that kid with the spiky hair? SHOBU! Flaming hand up in the air…SHOBU! Creatures battle in the zone…SHOBU! Win& take the trophy home…SHOBU! -Once you’re done o_Oing at the lyrics, you will realize what sort of anime you are dealing with. The background score is not impressive either. -As if the Duel Masters game weren’t hard enough to understand already, the animation studio further confuses the viewer by having matches that contradict the basic rules of the game. For example, a guy can have only five shields, but in the duel that happens in the 2nd episode, a guy gets five extra shields out of nowhere. And no explanation is provided. The way they contradict themselves is epic. -You know what, I can’t take it anymore. I’m ending this review right here. Unless you love the Trading Card Game (which I doubt you have even heard of), please do not go anywhere near this anime. If you want to watch a card battle game which doesn’t attempt to promote the game cheaply, then stay safe and go for Yu-Gi-Oh. - The battles in the mid and last-half of the show become unwatchable as nothing new is done, new cards which are introduced get overshadowed by the same talk after each move, show reactions after each move, show the crowd after each move, show every single supporting character after each move formula which feels like it's on a loop from the start and they just didn't realize it. Duel Masters started with an interesting card-game but it became stale as the story progressed because the show failed to do something new to keep you hooked. The same scene is done with the same angle but with different dialogues and characters. because they had the same formula on repeat. Reactions from every character and the crowd after each move while trying to build suspense reaches the breaking point as that's what you've been watching from the start. The story which could have saved this show had no work at all and felt like an add-on. There was an imbalance in the screentime as most of it was given to the battles but the time given to the characters wasn't used to create a strong background for them but instead it was used for comedy (which failed) and chitchat about the next or forgone battle. Focus on battles is what everyone wants but focus on the characters and the story is as important. 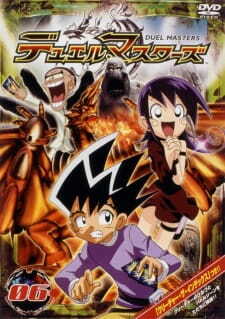 Duel Masters succeeded with the battles' screentime but failed with the story, characters and keeping the battles fresh. It was evident that the show's primary focus was to introduce a new card-game to the masses which is why the repetitive battles were the primary focus but that cannot be used as an excuse. If there is something positive about Duel Masters then it has to be Kokujo who is the only character to have some detail and a reason to be there in the show. The rest of the cast is given more time but unfortunately none of them becomes interesting enough to be likable and none has a reason to be there. Some "twists" are thrown in out of nowhere which makes the story look even more absurd. What's worse is that the show doesn't evolve, it's like running in a loop giving you a demo of the cardgame. What could have been a great anime, Duel Masters fails as a show and ends up being a promotional event for the card game. The characters had no work done, the animation styling was outdated and looked horrible, the comic timing was poor and the characters having no background made everything worse. The show tried to give as much screentime to the battles as possible but that failed because the time given to the characters was wasted. Having 26 episodes, the show's primary focus was to try and show every playing-card playable, that took a toll on the quality of the show as a whole and made a huge impact on the vision of the show. From the beginning and till the end the story and characters do not evolve at all and Duel Masters ends up being a poorly written Yu Gi Oh. Instead of learning from the flaws of the latter, the show failed to even learn from the positives as well. The only positive thing for the show would be nostalgia. Kids who grew up with the show might still end up liking it if they still have the playing-cards. But as an anime it fails to keep you hooked on your seats wanting for more. Instead you want it to end or you want to stop watching because you already know what will happen and it just isn't worth it to use your time bearing the characters and the animation. Nothing screams "anime" like a good old fashioned card battle. Two passionate characters build up their decks and fight it out for all the glory. Today, we'll take a look at the shows that truly represent anime card battles in their own unique way. Ever wondered what the Vanguard units' world is like? A realm where dragons, knights, aliens, and even the undead coexist in one place, where forces of light and dark fight for control over the land. Let's explore the six nations of Planet Cray as well as the clans that fall under each of them.